World Intellectual Property Day is April 26, just over a month away. This year’s theme is green innovation. The environment and climate change have become major political and public opinion issues in the over last few years. Companies and advertisers have certainly noticed this trend and are keen to link their products and services with environmentally friendly values. More and more products are being branded as “green”. 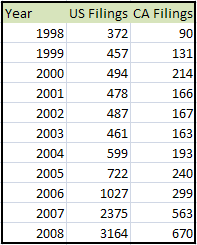 You can see this trend in trademark filings. 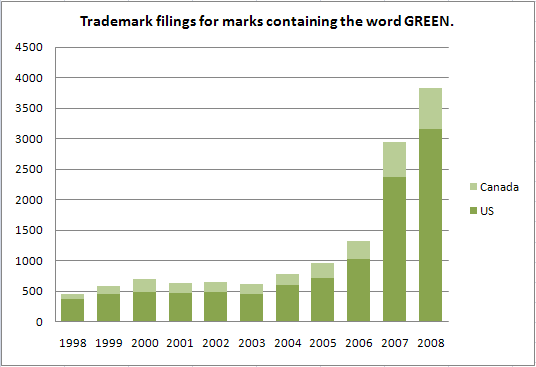 As the chart below shows, the number of US and Canadian trademark applications filed for marks containing the word GREEN increased dramatically in the last few years. In 2007 alone, the number of filings increased in the US 131 percent and in Canada 88 percent. Data source: USPTO and CIPO trademark databases, March 20, 2009. This entry was posted in environment, trademarks, WIPO, World IP Day. Bookmark the permalink.